A massive collection of all types of bicycle saddles to help you find your perfect fit. We’ve carefully selected a huge selection of saddles in all shapes and sizes. The goal of the wall is to simply offer everyone a chance to be comfortable whilst cycling. Bicycle saddles vary hugely in shape, construction, material, and width. What determines the saddle you need is dependent on your morphology, pelvic structure and cycling posture. Both are hugely complicated areas and the idea that you can be “measured” for a saddle is an incredible job by marketing departments to sell products. We combine expert knowledge, professional tooling and most importantly, your feedback to help you find your perfect saddle. With that in mind , we offer a “Saddle Speed Dating ” session. We set up your bike on a turbo trainer and try a range of saddles back to back to figure out which you prefer. 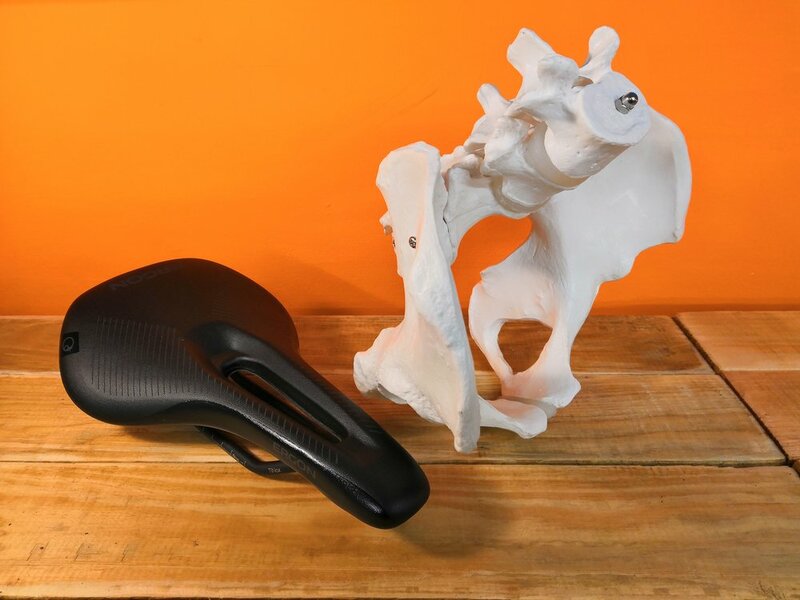 We will discuss your current saddle issues, cycling goals then look at sit bone width and pelvic rotation and find you a saddle that will work for you. The cost for this is £35 and is credited towards a saddle if you buy from us. We also have a selection of demo saddles that can be taken away and road tested. We charge an additional £50 deposit for these. Note : If you are in any way doubtful that your overall bike fit isn’t correct then we suggest you first start off with a bike fit. A sub-optimal fit is the biggest cause for saddle discomfort and we cannot stress how important it is to get this right first. We offer a Basic Bike Fit for people who generally cycle for an hour or less and an Advanced Bike Fit for anyone who cycles for more than an hour. Which saddles do we have? 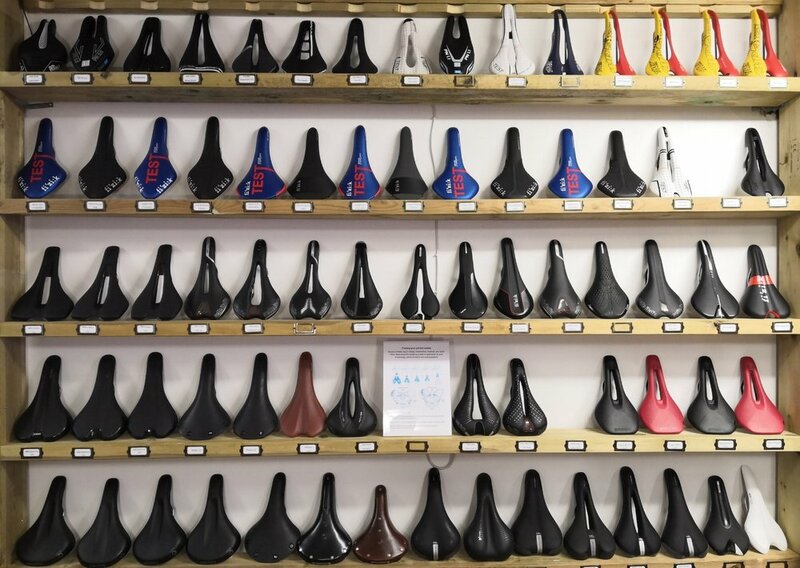 We have around 75 saddles on our wall. We have models from Brooks, Fizik, Ergon, Selle SMP, San Marco, Selle Italia, Selle Royal, Madison, PRO, and BBB. We everything from handmade leather touring saddles to high-performance triathlon saddles and everything in between. If there are any saddles not on our wall that you’d like to try then please contact us. Determining how you interact with a saddle is the key to narrowing down your options. Your riding style and cycling posture will largely dictate the type of saddle will suit your needs. Your cycling posture, morphology, pelvic structure, typical power output and duration of rides will then further guide your decision. Even when you narrow down the type of saddle you require, the variations may look small but can make a profound difference on comfort. We’re proud to be able to offer such a wide variety of brands and have absolutely no loyalty or bias towards any particular brand. What ever works for you.